This recipe starts with the cazuela on the stove top for sautéing, and then, once the fish fillets are added, you slip the cazuela into the oven. The fish is served with a red pepper and almond sauce, a loose adaptation of the Spanish romesco. Any firm white fish fillets can be substituted for the sea bass. 1. Add the olive oil to a 12-inch cazuela or skillet and heat slowly over medium-low heat. When the oil is hot enough to sizzle a piece of onion, increase the heat to medium, add the onion, and sauté, stirring, for 15 minutes, or until golden. Add the garlic and sauté for 5 minutes, or until softened. Stir in the paprika. 3. Add the broken, seeded tomatoes to the onion mixture and simmer over medium heat for 10 minutes, or until the mixture has cooked down. Add ½ teaspoon of salt and a grinding of pepper and remove from the heat. 4. While the tomato mixture is simmering, preheat the oven to 400°F. 5. 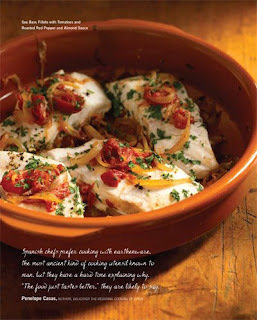 If using a cazuela, arrange the fish fillets in a single layer on top of the tomato mixture. Season the fish with salt and pepper and sprinkle with the parsley. Place a spoonful of the tomato mixture on top of each fillet. If using a skillet, transfer the tomato mixture to a 2-quart shallow baking dish and arrange the fish fillets in a single layer on top. Season with salt and pepper and sprinkle with the parsley. Place a spoonful of the tomato mixture on top of each fillet. 6. Place the cazuela or baking dish in the hot oven (it’s fine to put it in a hot oven because it has been preheated on the stove top) and bake the fish for 15 minutes, or until the thickest part of a fillet is opaque, rather than translucent, when tested with the tip of a small knife. 7. While the fish is baking, make the sauce: Put the almonds in a small, dry skillet, place over medium-low heat, and heat, shaking the pan, for 5 minutes, or until lightly toasted. Let the almonds cool slightly and then transfer to a blender. Add the garlic, peppers, salt, and paprika, and process until pureed, stopping to scrape down the sides of the blender as needed. With the motor running, add 4 tablespoons of the olive oil in a thin, steady stream. Taste and add more olive oil as needed to correct the balance. Add the vinegar and process to combine. Alternatively, make the sauce in a mortar: First crush the garlic and salt with a pestle. Then add the almonds and pound until the mixture forms a paste. Add the peppers and pound until blended. Slowly add the olive oil, pounding until the mixture is light and smooth. Add the vinegar and stir to blend. You should have about 1 cup of sauce. Taste and add more salt as needed. Transfer to a small serving bowl. 8. To serve, place the cazuela in the center of the table. Pass the sauce.